The Waynesboro Police Department is investigating an armed robbery that occurred early Sunday morning, March 27,at the Shell Station located at 301 E. Broad St.
An unknown black male wearing a black toboggan pulled over his face entered the store and approached the 26-year-old female clerk demanding money. He was displaying a gray-colored semi-automatic handgun, and the victim complied with his demands handing him an undisclosed amount of money. The suspect then left the store traveling in an unknown direction on foot. 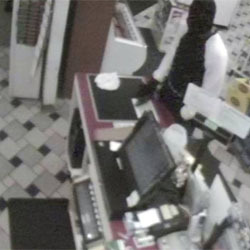 The store surveillance system captured video of crime. The case remains under investigation, and the department requests anyone who may be able to identify the suspect or who has information about the crime to contact police at 540.942.6543 or Crime Stoppers at 800.322.2017.